Sometimes, we bemoan dreams we had that have never come to pass - the strange thing is while bemoaning this fact, we never pause to think "would this dream even fit the person I am today?" Nor do people (as a group) tend to realize some dreams you should let go of and look for new ones. Some dreams come and go, some stay for the duration. 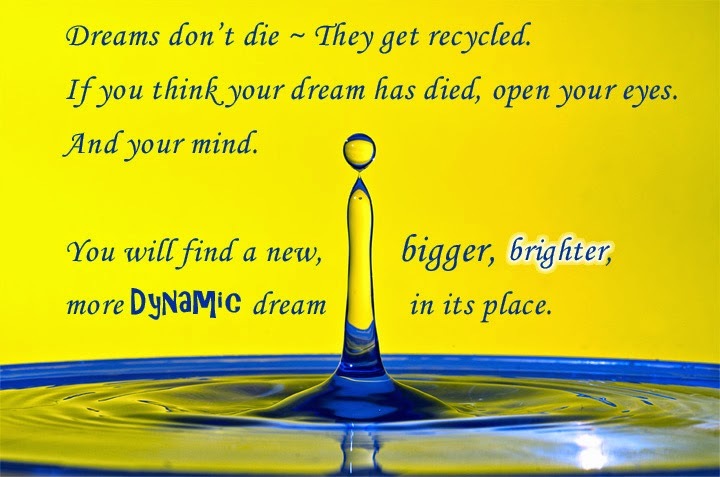 If a dream no longer serves you, let it die - let it get recycled and someone else can use it. Create your own dreams, your own past, present, and future. Don't dream safe - for in safety there is no thrill. Dream about what you really want, not that which someone else tells you that you should want. See it. Imagine it. Feel yourself having it. And then let yourself have it and create a new, fantastic dream. Don't you love this time of year? I'll admit it. I love Autumn. The leaves are falling from the trees and each morning wakes up with that wonderful crispness that says that snow is coming soon. I know I haven't done a lot here since the Summer of Change ended. I've been uber busy. How uber busy? Well, let's put it this way - I have 4 pseudonyms and I write in many different genres. 2 of my pseudonyms have huge book launches this month and I've been working on them for the last 6 weeks.